The Reds director of player development, Tim Naehring commented on the status young Felipe Lopez. Lopez was looking at a year's worth of rehabilitation after dislocating his ankle. "These things happen. It's a harsh game," Naehring told MLB.com in July 2003. "It's going to make for a long year for the kid." Naehring spoke from experience. In his own eight-season career, spent entirely with Boston, he spent time on the disabled list on seven different occasions. The seventh time ended his career. 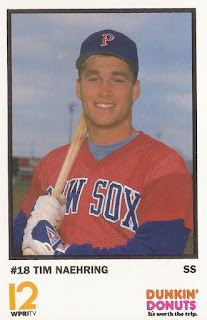 A native of Cincinnati, Naehring was drafted by the Red Sox in the eighth round of the 1988 draft out of Miami University. He played that first season at short-season Elmira and single-A Winter Haven, hitting .250 between them. He started the next season at single-A Lynchburg, hitting .301. He then made the jump directly to AAA Pawtucket, a jump that The South Florida Sun-Sentinel wrote showed him as one of the Red Sox' top prospects. By late August, he was hitting .276 with 31 RBIs. Naehring made it to spring training the next year, making an impression, hitting .376 with three home runs, according to The Orlando Sentinel. ''I told him to go hit .300, and we'd see him soon,'' Morgan added later to The Sentinel. Soon was July 15. 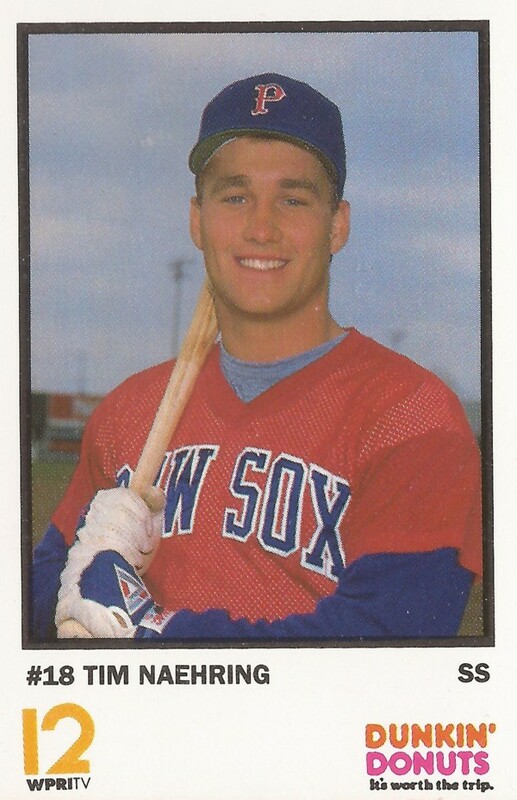 In 24 games for the Red Sox that year, Naehring hit .271 with two home runs. One of those home runs came in an early August game, one where he drove in four runs. Then came Naehring's first injury, a back injury that caused him to lose the last month of the season. But he was back the next spring. He was also well enough to make the team, playing in April and May, until another back injury. Naehring started getting more playing time in 1992, with 72 games. In 1994, it was 80 games. In 1995 and 1996, Naehring's playing time topped 100 games. Throughout his eight-season playing career, Naehring hit .282 with 49 home runs. Two of those home runs ended lengthy extra-inning games. In April 1992, Naehring ended a 19-inning contest with a two-run shot. In June 1996, it was a 15-inning contest. "I just wanted to get it over with,'' Naehring told The Hartford Courant after the 1996 game. His career was finally over with in 1998 after arm surgery. He had previously undergone a number of surgeries. He underwent surgery that June in 1991 and was done for the year. Two years later, it was shoulder surgery in a year where he played just 39 games. Then, in June 1997, it was elbow surgery after an off-balance throw. But after the surgery, his problems seemed to grow. Scar tissue meant he could hardly bend his right arm. He had another surgery in May 1998. But by February, he was already worried his career might be over, worries that proved correct. "You always think about those things when you go through four or five months without being able to move your right arm," Naehring told The Boston Globe. "If this does do that, I'll just thank the organization, and thank the game, because I got a great headstart on life."